Spring can be a busy season for the popular pastor. Speaking engagements, special appearances and conference sessions often dominate the schedules of those who are in demand. Of course, sometimes a pastor is not traveling anywhere, but just needs a break from the weekly grind. That’s when it helps to have like-minded friends who are equally as popular. Perhaps Stovall Weems, pastor of Celebration Church in Jacksonville, found himself in just such a scenario as he eagerly welcomed into his pulpit friend and fellow Seeker-Driven pastor Steven Furtick of Elevation Church. Weems and Furtick know each other well, as Weems was one of the featured speakers at Furtick’s Code Orange Revival earlier this year. As was discussed in“Code Orange” Speaker Stovall Weems, this pastor, like the majority of the other Code Orange speakers, has demonstrated his propensity toward the teachings of the Word Faith movement, as well as his tendency to base teachings and truths upon mere emotions and experiences. Of course, in posts such as Steven Furtick is Lookin’ for the Favor, it has been shown that Furtick himself shares these same Word Faith sympathies. 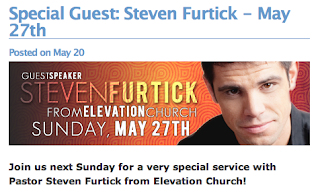 Now, Furtick’s appearance at Celebration Church leaves one with a dilemma. With Steven Furtick away from Elevation Church just as his latest sermon series,How to Hug a Vampire, is getting underway, who could adequately take the stage in his place? 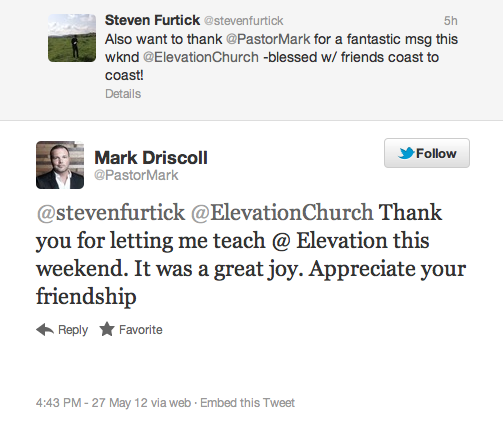 It seems that Mark Driscoll, of Mars Hill Church in Seattle was up to the challenge. While Driscoll was not part of the Code Orange event, he and Steven Furtick have a demonstrated friendship primarily through, it seems, the Elephant Room (ER) events. Both men were present at ER1 and ER2. In fact, it was Driscoll who pitched questions at Word Faith modalist T.D. Jakes, attempting to confirm Jakes’ belief in the Trinity. The ultimate result of this questioning, after some some slippery footwork from Jakes, was him receiving a blessing and a pass from his fellow ER2 participants. Jakes must have made quite an impact that evening, as even James MacDonald noted that he “learned a ton” from the prosperity preaching mogul. T.D. Jakes haspreached at Elevation Church since the Code Orange event, taking the same stage that Mark Driscoll stood on this weekend. Of course, it is natural to assume that agreeing to preach for somebody, or inviting somebody to preach for you, is an endorsement of sorts. Assuming that, then, and being aware of their ministries, the presence of Steven Furtick at Stovall Weems’ church is far from surprising. Yet, what about Mark Driscoll taking the stage at Elevation to preach, not at a special event, but at a Sunday service? Mark Driscoll, former member of The Gospel Coalition and supposed Young, Restless and Reformed pastor…what would be his interest in a church and ministry that straddles the line of Word Faith? But then, who would have thought that a Reformed pastor would ever welcome a Word Faith, prosperity preaching, modalism-teaching heretic into the fold of evangelicalism? Let’s also not forget that Mark Driscoll quite recently promoted popular Word Faith teacher Brian Houston of Hillsong Church. There seems to be a pattern developing. The Word Faith movement is no longer on the fringe, friends. Mark Driscoll Promoting Word Faith Teacher Brian Houston? “We Can Work It Out,” Is Steven Furtick Qualified to Have this Conversation?